As of this week, I have officially started Christmas shopping. I have always hated waiting until the last minute and I love starting to shop in November (or earlier). Gift giving is truly my love language. There are few things in life that I enjoy more than giving someone I love something I know they’re going to love. Christmas is a special time of year, and I’ll be the first to say it is about so much more than the presents. Celebrating the birth of Jesus is beautiful and there is just something about hearing Christmas carols sung by a choir that brings a tear to my eye. All that being said, showing love through gifts on Christmas Eve is one of my favorite family traditions. The two people in my family that I usually have the hardest time buying for are the men: my dad and husband. (Shout out to my BIL, Robby, for usually making it easy on me!) 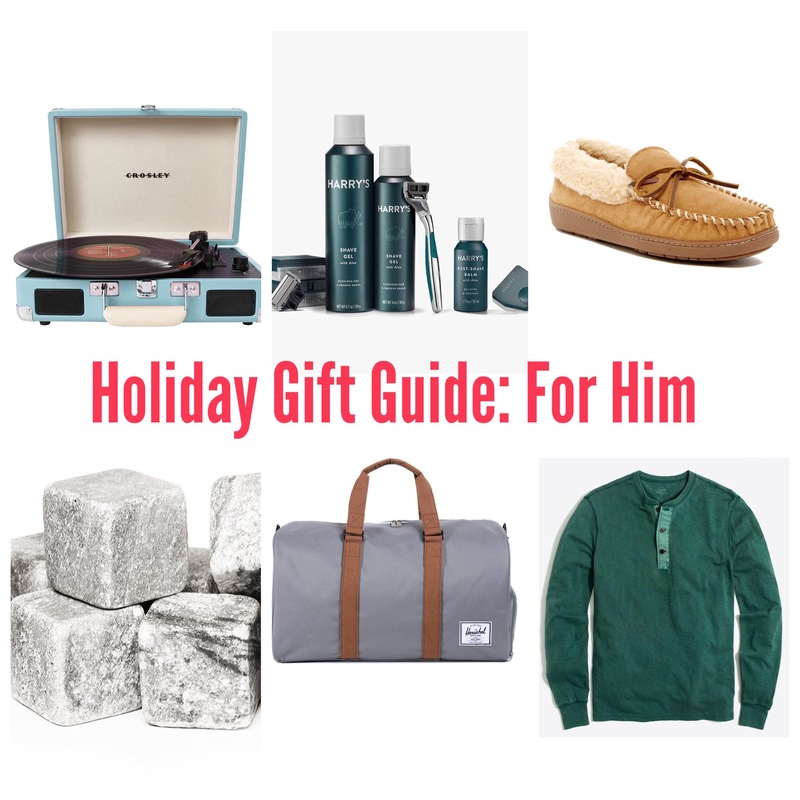 I wanted to share a few of my favorite gift ideas for those hard-to-buy-for men! I actually bought these for Dustin for his birthday and he LOVES them. They are the softest sweatpants and they are over the top comfortable. They fit true to size and are perfect for cuddling up on the couch! I love these henley t shirts as well. They are so versatile but super comfortable. They can easily be worn with jeans and a vest or khakis and a pullover. They are on sale, too! The Echo is a great gift because it has so many different uses! You can play music, check the weather, set reminders, and even call an Uber. Also the second generation has an updated speaker so it sounds even better now. The Powerbeats Wireless earphones are perfect for someone who travels frequently, works out frequently, or talks on the phone often. All three of these fit Dustin. They are a little expensive, but the charge lasts for 12 hours and only has to charge for 5 minutes! That’s pretty impressive. This duffle bag is great for weekend trips! It has a shoe compartment and an internal storage sleeve. It also comes in tons of colors and is under $90! This decanter is beautiful and fits in perfectly with any bar set. It can also be monogrammed. This along with a bottle of bourbon and you’re set! These drinking stones are another great gift for a bourbon lover (looking at you, Dad). They keep your cocktail cold without diluting it at all. These could be a fun stocking stuffer! These slippers are everything!! Who doesn’t want warm, cozy feet in the winter? They are super affordable (under $30!!) and any guy will absolutely love them. Dustin and I have both been using Harry’s razors for a few years now. They work so well are are super affordable. They will mail you refills so you don’t have to buy overpriced replacements at the store. This would be a perfect gift because it’s a starter kit. The shave gel works great for sensitive skin, too! I think there is something so cool about giving someone a record player. Vinyl just sounds better, right? This portable Crosley is not only cute, but can play our favorite 45s without taking up too much space. It comes in tons of fun colors and paired with a few records would make an awesome gift. I hope these gift ideas are helpful! What are you guys buying your dads, brothers, boyfriends, or husbands?